If you've seen any of my YouTube videos, you may have noticed the big blue board. That is my most valuable teaching tool- my felt board! If you don't know what one is, it is a piece of wood covered with felt. I use it daily and couldn't live without it! 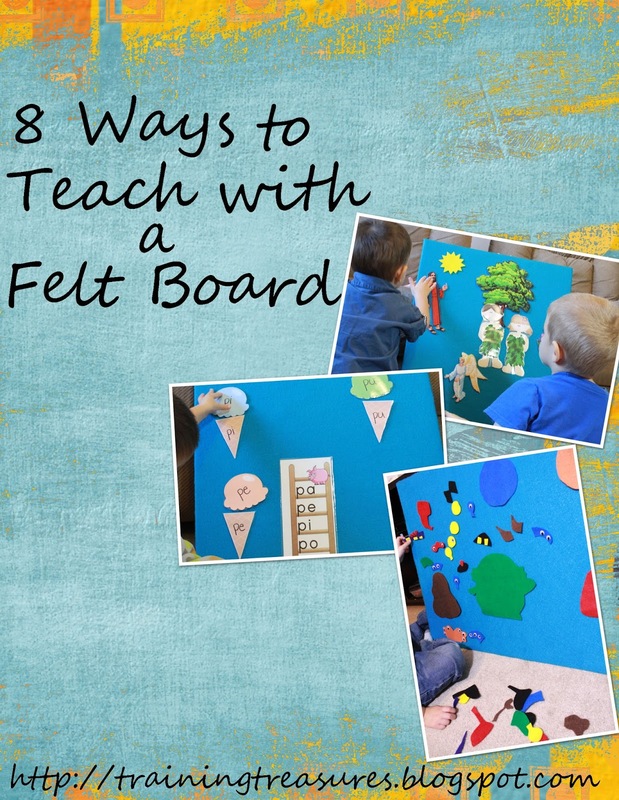 Here are 8 ways we use a felt board in our homeschool. My children are taught the Bible daily, and I'll be honest- I need a little help in making the Scriptures come alive! You can either purchase felt characters or make your own. We are using a combination of both in this picture. The kids love helping put up the people. We use the Abeka curriculum in our homeschool, and my kids have specific poems that they are supposed to learn. I never had to memorize poetry as a child, so this was something I had to get used to. I didn't really see a point, nor did I know how to make memorizing poetry fun for my kids. Did I learn how to use poetry in my class in college? Yes! I love poetry, and wrote it for years during my childhood! But memorizing classic poems . . . ? I needed help, so I decided to make visuals. I found clipart online, colored them, and laminated them. Then, I hot glued felt to the back so they would stick to the board. My children get to see, touch, hear, say, and even act out the poems. This is one of our favorite things to do! What's fun is finding one of the poems we memorized in a poetry book from the library. Teaching phonics can be boring and downright frustrating if you do it wrong. I found these awesome free ice cream cones from TpT, printed, and laminated them. Then I wrote phonics blends on them and turned them into a matching game. I've also done it with cupcakes . . .
"hot chocolate" and marshmallows . . .
and more! Watch my Youtube video to see how we play! Flapped their wings and then they said, "Boo!" Please, oh please, say, "Who who who!" You repeat the poem, changing the word "boo" to rhyming words- glue, shoe, moo, etc. Although we aren't counting up or down, my 2-yr old is seeing 5 owls and memorizing what 5 actually looks like. And this poem teaches rhyming too, which is a nice bonus! I have also taught patterns with my felt board, and numbers. Here, my 5-yr old had to create numbers I told him. Sometimes I gave him a specific number. Other times I told him to make any number from the 50's family. I bet you can guess what song we are singing! That's right- "One little, two little, three little Indians . . . "
The kids put up the Indians as we count up, and they take them down as we count down. This gets a bit tricky, as they have to take turns. We mess up a lot, but this is one of their favorite things to do! This is a counting song, which covers two subjects at once. I like to teach my children classic stories. Although my 5-yr old can listen to stories and understand them even if they don't have visuals, my 2-yr old is not there yet. This morning I told, "The Boy Who Cried Wolf," tying it into our Bible review of Adam and Eve. Although Jesus is our Shepherd, the boy in this story was more like the serpent in the Garden of Eden because he lied. This is a great story for little ones who love to tell lies, or even for children that think everything is an emergency! I colored pictures to represent the different items in the story, laminated them, and then hot glued felt to the back to make them stick. The kids love, LOVE, story time with the felt board! I created a Halloween felt set for the kids to play with. I pulled it out and told them a fun story. Then, it was their turn to make up stories! I was shocked when my outgoing 5-yr old didn't want to tell a story at first, that is, until he saw his younger brother impress me! Watch my 2-yr old tell a Halloween story! I love watching my boys create scenes and play with the felt pieces I made for them! Sometimes they tell stories, other times they are designing a scene. I personally enjoy creating the monsters with them! I have made lots of different playing sets- robots, frogs, etc. All you need is a good coloring book for some inspiration! Cut out whatever template you want, trace onto felt, cut out, and decorate using glitter glue, googly eyes, or more felt to add color and details. Felt boards make a great addition to any family- whether homeschooling or not! And they are a lot of fun to create! Do you use a felt board? What are some ways you use yours? Comment below! And as always, be sure to Subscribe so you don't miss any freebies or updates!